I almost don’t want to write this. I’m afraid that somehow the words won’t be big enough or that the joy will escape before I can figure out how to describe it. I don’t know where to start. I don’t know how words can possibly convey the enormity of the experience. How do you describe light? How do you tell magic? How do you write heaven? The best I can do is share the pieces. It’s bound to be choppy and a little – OK, a lot – disorganized. Grammar will be summarily dismissed, or at the very least disregarded. I don’t know how else to do it. There were just so many individual experiences contained within the whole – so many small and not at all small moments that will stay with me (and I dare say my girl too) forever. Or when we explained in the car on the way to the theater that this was a rehearsal – a practice – and that they might have to stop singing in the middle of a song. How Katie sang and I yelled, “CUT!” so that Brooke would understand what might happen. When it became a game and she started calling out songs for her sister to sing. When the play began and John the Baptist came from behind us singing Prepare Ye and Brooke sat watching the cast – rapt and silent, with a ferocity and intensity and complete, unwavering attention, the likes of which I have never seen and am failing miserably to convey here. How she announced after every score which one would be coming next. How she knew each and every line and each and every song and the order in which they would come. How the Jesus doll applauded after every scene – his own biggest fan. How she rolled with the nuances of the show, dutifully pointing out – yet blissfully unruffled by – the differences even as I held my breath, hoping we’d prepared her enough for the fact that it wouldn’t be exactly what she knew. How the words of each song exploded like fireworks and hung in the air around us. How Luau and I looked at each other through tears as the cast’s clear, strong voices joined together in All Good Gifts. How we exchanged a glance acknowledging that no other words could have meant more in the moment. How Brooke pointed skyward with the actors as they sang Bless the Lord, her favorite of all. How even as she begged to go home during the intermission, confused and upset that the actors had disappeared, it was all OK. Yes, even then, when we convinced her to stay and promised her that they would return. How Katie asked to take her to the ladies room and yes, I let them go alone. How they came back without incident and sat back down, ready for the show. How she came to life during, “Turn Back, O Man” excitedly telling all who would listen that that was Mary Magdalene. How I tried to hold back tears as Brooke climbed up on my lap and we listened together to my favorite song, By My Side. How the soft melody wrapped itself around us like a blanket and how I would have sworn that the lyrics were written just for us, just for the moment. How I kissed the top of Brooke’s head, again and again throughout the song, thinking that my girl was WITH me. Realizing in a blessed moment of perfection that we were truly, blissfully TOGETHER. How she let me rock her to the music, swaying in my arms. How she asked the whole ride home if we could invite Mary Magdalene to our house for a playdate. How her aide at school yesterday told me that she was beaming all day. How when Brooke had crawled onto her knees, joined her hands, bowed her head and closed her eyes in class, she had smiled and told her that she could pray, but perhaps not in the middle of the classroom. I had a very different experience. While I don’t take anything at all away from his sentiment, I have to say it was nothing like mine. For me, the night was anything BUT typical. He later told me that he felt like autism wasn’t there. That for three ecstatic hours, it had receded into the background and blessedly, finally, just didn’t matter. For me, autism was front and center that night. Autism was part of what made the whole thing what it was. There is nothing in our world that compares to Brooke’s pervasive and abiding love of Godspell. Sure, Katie loves Taylor Swift and a show would be a hoot. But does she listen to her EVERY day, google her, watch clips of her EVERY chance she gets? Does she draw pictures of her in Halloween costumes, at the dinner table, riding on a rocket ship? Does she talk about her, reference her, create games and scripts and whole worlds around her? Is she literally imbedded in every aspect of her life? No. I can think of nothing that comes close. If Brooke were not who she is – autism and all – that experience would never have been what it was. For her nor for us. While I’m not ready to say that I’m grateful for autism in and of itself, I am deeply thankful that within it there are moments like this. Moments of grace, moments of joy, moments when judgement is replaced by generosity and kindness and the world comes together to make something wonderful happen for a little girl who deserves nothing less. beautiful. in every way imaginable. Love it. So beautiful. I see both your husbands and your perspectives. Thank you for sharing. Oh my…I am breathless and teary and fulfilled. Thank you, what a perfect way to start the day. Priceless. So happy you had this amazing experience — all of you. FABULOUS!!!! I am so glad you did write this. Thanks for sharing with all of us. What a joyfilled experience! In tears over here. You may not think you captured it, but those of us who KNOW what it is like and those of us who follow your girls and LOVE them from afar KNOW what you were feeling, can truly picture the magic you all experienced, can see the brilliant shining light in her gorgeous eyes. So happy that you all got to experience this! Amen for magic! huggs so happy that you had that forever moment! I think I can hum the chorus of “Day by Day” but that’s the extent of my Godspell knowledge…after reading these posts I think I have have to rent a DVD or two. Who knew Victor Garber was great even before he was in “Alias”? Your family deserved these hours of bliss…thank you for sharing! I love that we talked about this – that you worried about what and how to write about this. We got it. Big time. Mucho tears – so worth waiting for Jess – every detail. Thanks for sharing it all, every day. I am with everyone above – I can start my day now – I feel fulfilled! Thanks Jess. This is the most wonderful thing I have ever been lucky enough to stumble upon (I found your blog by chance). Thank you so much for sharing your little girl’s passion with us. The photo is unbeatable. Maybe not typical. But good. So good. beautiful, such a wonderful scene you’ve painted for us, thanks so much for sharing this. it’s nice to know that, even though the bad days can be really bad, the good ones can be AMAZINGLY good. i’ve said it a million times already, but i’ll continue to say it: that little one of yours is a gift. It was hard to read through the tears. “Where are you Going” tugs at my heart anyway – now I’m clutching Kleenex and I’ll never hear it the same way again. What a wonderful gift. Thank you for sharing it with us. Love- in all of its forms- is magic. Whether that love is defined by autism- as in love for the musical- or love of a family who is joining their child in her autism, when you can have love, it’s magic. You captured it just fine, honey. Brilliantly, in fact. I love that the two songs you quoted are my two favorites, too. I get mushy & weepy whenever I sing or hear them. Now? Holy cow, they will never again be quite the same. But how do you remove a speck of sawdust from your brother’s eye when all the while there’s a big plank in your own? you every minute (but then, again I often do). We have a lot to be Thankful for this Thanksgiving. Thank you so much for sharing your story, you have no idea how much inspiration you give! Crying again at your incredible descriptions and how much love it involved! My cup is full and running over. Are you aware of the book Autism’s Hidden Blessings by Kelly Langston? She describes how our wonderful children on the spectrum have a special relationship with God and He with them. Your Brooke proves this premise! I knew it. I knew this post was going to make me into a soggy mess. I just knew it. Bless the Lord, my soul! And bless Brooke and her wonderful family. (psst…we DO get it. The highest high. You described it perfectly!). You all DESERVED this. Every blessed moment of it. Thank you, dear Jess, for sharing it. DOAM, if I could only steal your persective, ‘moments when judgement is replaced by generosity and kindness and the world comes together to make something wonderful happen for a little girl who deserves nothing less”, and have it stay with me always, I would be 1 happy camper. I love the two perspectives of you and Luau – you are a magical couple with a daughter blessed and touched by grace — you are blessed because you see the grace!~ Tom and I are so blessed to know you. God bless and hugs to you and your beautiful family. You captured the moment beautifully Jess. I woke up this morning anticipating this wonderful post, thank you so much for sharing the experience with us. you got the magic and heaven…. p.s. was the director’s name Jason? The director is L; the choreographer is J. All of us involved are so thrilled we could share this show with your family! Awesome. So happy for her and for you. thank you for letting us share this with you. That was so beautiful and it made my heart just swell with joy for you and your family! I read your blog every chance I get and share it with my parents and my sister and her husband, (their oldest child Zach has autism, and his focus is Pokemon)! You are such a joy and blessing and I am so happy that Brooke got to experience Godspell in real life! I’m so happy that Brooke and your family were able to have this experience! I’m sure it’s an evening none of you will ever forget! What a wonderful experience for you all! I have never seen Godspell but I think I’m going to put it in my queue. There’s something so magical about our kids seeing something they so dearly love come to life – real and in person. I’m so happy that you all had this opportunity. I have a feeling that somebody whose name starts with a “J” was smiling down from Heaven(and perhaps wiping away a happy tear) as He watched you and Brooke. OH,OH,OH!!! Long, long, day, but I knew I’d have this to look forward to, and BOY did you deliver. Literal, actual chills. I am SO HAPPY you all got to experience this, and I know she will never forget it. A happy Thanksgiving indeed! wow, thanks, and the grammar was fine. What a magical night, indeed. I like get how you and Luau had such different perspectives. Incredible post! I especially loved the different perspectives that you and Luau had. Have a wonderful holiday. You are a special family. A perfect example of going to any lengths to bring meaning into what autism “caught”. 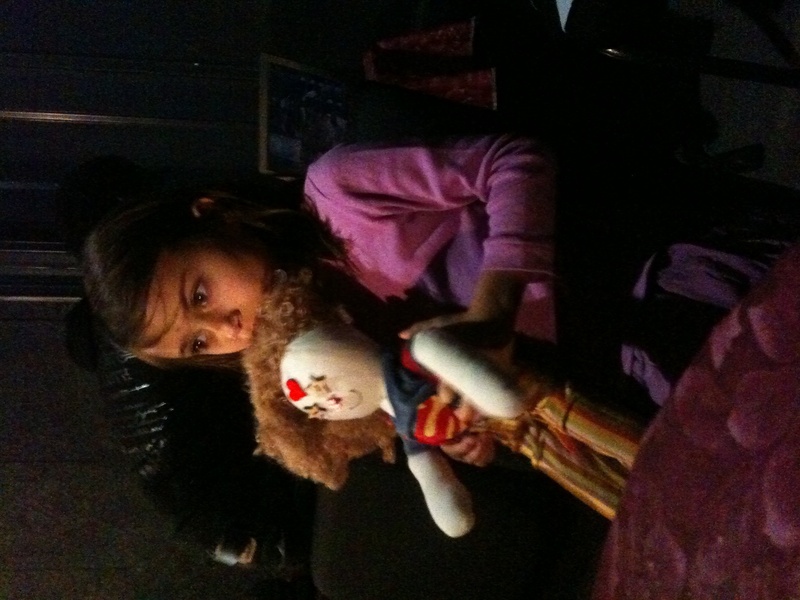 The doll you made is the best!